Motorcyclists are twice as likely to be involved in a serious or fatal accident due to diesel spillages compared to ice. A motorcyclist does not have the same protection as a car driver and contact with diesel on the road surface will often cause a catastrophic loss of control. Spillage of diesel arises from a negligent act, either overfilling a tank or failing to secure the fuel cap properly. Often the driver who caused the spill has long since gone from the area. How then, can you claim for personal injury and financial loss? You can make a claim to the Motor Insurers Bureau (MIB) under their Untraced Driver’ Agreement. Inform the Police immediately and certainly within 14 days (5 days for property only claims). If you or someone in your party has been injured, ask the Police to attend the accident scene and record the extent of the diesel spill. Inform the local Council of the diesel spill and keep a note of that record including the name of the person you spoke to. 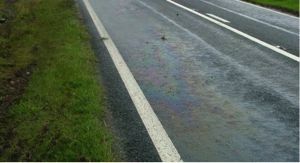 Obtain details of any witnesses at the scene and ask them to confirm the presence and extent of the diesel spill. Take photographs and measurements of the diesel spill. Note a full description of the accident scene including road number, direction of travel, and speed on approach and weather conditions. Complete a sketch and retain this information. The MIB will consider your claim if the incident has been reported to the police within 14 days and the spillage is “large”. What constitutes “large" can be difficult to define, but generally if the local authority is called in to cleanse the road or if the Police officers in attendance consider the spillage a hazard, that should be sufficient.